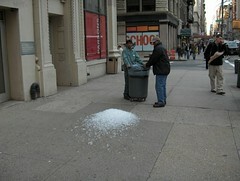 Walking home from work yesterday, these guys were wheeling a trash can full of ice down the street. One guy looked up and the trash can hit a rough spot in the sidewalk and he and the trash can went down. This was the aftermath. The guy on the left, who spilled the ice, gave me a funny look after I shot this.